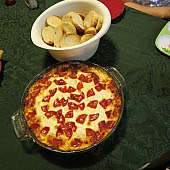 I know others have posted pizza dip recipes, and I looked up a bunch till I found out more about how to prepare and then did it up Marksville style. Some use crock pots, microwaves, stove top, or even ovens. I chose oven. 2. Spread the cream cheese over the bottom of a 9-inch pie plate. Top with ½ cup of the shredded mozzarella and ½ cup of the Parmesan cheese. 3. Spread the pizza sauce on top of the cheeses, and then top with the remaining ½ cup of mozzarella cheese and ½ cup of Parmesan cheese. 4. Top with pepperoni slices. 5. Bake until the cheese is melted and bubbly, about 20 minutes. Serve with toasted baguette slices. You can always add olives, green peppers, ham, pineapple or anything else you might like on your pizza on top. Use your imagination. All I can say is that my family gobbled this up and have been asking for me to make it again.